A new book by Martine Rothblatt, Co-CEO and Chair of United Therapeutics, envisions a mind clone — a digital copy of your mind outside your body — that can go on living after you are gone. But the book is not science fiction; it is a nonfiction book by someone who has been a technological innovator. After founding Sirius Satellite Radio, Rothblatt left to find a cure for her daughter’s rare disease. Today, United Therapeutics is focused on developing an endless supply of manufactured organs. 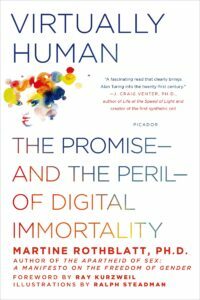 In a conversation with Wharton management professor Katherine Klein, Rothblatt discusses her work at United Therapeutics and her new book Virtually Human: The Promise and Peril of Digital Immortality. Katherine Klein: Our guest today is Martine Rothblatt, Co-CEO and Chair of United Therapeutics. Martine, you have an extraordinary background, and I thought I would give a quick summary of how you’re often described, so we can cover a lot of your accomplishments. [You are a] lawyer; author; satellite entrepreneur; futurist; pharma-tycoon; philosopher; helicopter pilot; founder of Sirius Satellite Radio; chair and Co-CEO of the bio-technology company United Therapeutics, which you founded to save your daughter’s life; highest-paid female CEO in 2013; born a man, now a transgender woman; father of four; and spouse to the same woman, Bina Rothblatt, for 33 years. That is an extraordinary life, to date. What accomplishment are you most proud of? Rothblatt: I think I’m most proud of the family that Bina and I have created together. Certainly my favorite part of every day is the part of the day that I’m with Bina, my partner. And the only thing that makes that even better is when we’re with one of our kids or grandkids. Klein: You’ve led a number of companies, and you’ve founded a number of companies. Let’s start with your life as a CEO. If you’re looking at the week ahead and you’re saying, “Well, it’s a typical week” — what’s a typical week? Rothblatt: A typical week is interacting with different people who work in our company. If I’m someplace where I could see them face to face, I like to walk through the corridor. I like to go to people’s offices. I like to go into the laboratories. I just like to say, “Hi, what’s going on? What are you working on?” [I like to] look people eye-to-eye so that you can really engage with [them] and not make them feel rushed [and] you’re on your way someplace…. I spend a good chunk of each day – a quarter of it, maybe more – on the telephone, doing the same sort of thing, talking through a particular challenge or problem or different options, and trying to reach a mind meld with everybody I talk with, in terms of, what we should do together next. Klein: You’re leading a highly technical company, United Therapeutics, which you founded to save your daughter’s life when she was diagnosed with pulmonary arterial hypertension. You’re not a doctor, an M.D. or a pharmacist. Leading this company, how do you navigate where you are pushing forward the scientific R&D agenda and where you are deferring to others? Rothblatt: It’s on the larger scale issues that I’m leading. On the finer scale … I delegate to others. For example, a classical decision would be whether to develop a medicine or not. I’ve never made one of those decisions dictatorially. But I would lead that decision and try to urge people to see the benefits of developing a medicine for a particular disease. Hopefully there’s ultimately a consensus to do so. That’s something that I would lead. Exactly how you go about developing the drug for that disease involves literally thousands of sub-decisions that have to be made in terms of, for example, a clinical trial. The most important part of a clinical trial is, what’s the end point? A clinical trial is an experiment. It’s an experiment involving human beings. Therefore, you have to have a hypothesis. The hypothesis has to be stated in such a way that there’s going to be an either-or answer. That either-or answer is the end point. Depending on what that end point is, a clinical trial, which will take millions of dollars and years of effort, can either be set up to fail, can be set up to succeed or can be an indeterminate failure or success. It’s really somewhat in the science, in the randomness, whether it’s a success or failure. I won’t be the person that sets the end points. I won’t be the person that decides the main elements of the trial. But I’ll definitely be the person that questions every decision that’s made. My main job on the lower level is to question people’s decisions and to do the best I can to see that they have thought through the decision. Klein: In the company, there’s a line — a motto or guideline — one hears often to “identify the corridors of indifference and run like hell down them.” What does that mean? Rothblatt: It’s a concept I learned in business school. Originally, I think that this principle was best identified perhaps by Jack Welch, the iconic CEO of General Electric, who said to be successful in a business, you need to be either number one or number two in that business. And if you enter a business, and you’re not number one or number two, you’re going to have to spend an amount of money equal to the revenues of number one or number two, which often could be a huge sum, especially if you’re just entering the business. Klein: Was this part of the philosophy that led you to think, “I can start a company and I will make this a successful company around an orphan disease”? Rothblatt: I can’t really say that I was very intellectual about founding the company to go after my daughter’s disease. I’m reminded of a great line that I read just last week in Diane von Fürstenberg’s most recent book, The Woman I Wanted to Be. She’s built DVF into a huge enterprise, and she said she never had a business plan. She just pursued her passion, which for her was fashion. For me, I had to save Jenesis, my daughter. I didn’t really think through it so much, like, “Okay, this is an orphan disease. I’ll be a leader in this business segment.” Frankly, I didn’t care if I made a penny in this entire area. I just wanted to save my daughter. Klein: Let’s talk a little bit more about the company, United Therapeutics. You’ve had a run of successful medicines, but now are moving to think about lung transplantation and xenotransplantation. Why the shift? Why this progression? Rothblatt: What we’re trying to do is to develop a market for manufactured organs. Manufactured organs, such as lungs, for example, are really just another type of medicine. It’s a medicine that you take just one time, and it pretty much cures your disease. People are used to thinking of medicines as something that are pills in a bottle or something that’s injected in a syringe. But they don’t have to be that way. For a number of years, there has been skin as a product for people who have terrible burns, and it’s possible to grow skin as layers and lay it down. For other conditions, there have been tissues, which are collections of literally millions or even tens of millions of cells, which are provided to patients. My original inspiration in manufactured organs was, in fact, from my maternal grandmother who required a porcine heart valve because she had cardiac valvular disease. She would have died of a heart attack. They removed her heart valve and put in the heart valve from a pig. Rothblatt: This was in the ‘70s. Klein: Wow. So it has been around for a while. Rothblatt: Yes. That was my initial interest and the credibility that I gave this field. Our daughter’s condition, pulmonary hypertension, is treated by our medicine. In fact, our competitors also have medicines for this disease. But not one of these medicines is a cure for the disease. The disease involves at least three and maybe five different things going wrong in the body. That’s probably why it’s an orphan, or rare, disease because you need to have three to five different things all go wrong to end up with this disease. As a result of that, coming up with a cure like a silver bullet is pretty darn hard because you need five cures to cure it. It so happens that when you replace a person’s lung, they never get the disease again. So whatever causes the disease, it’s resident in the lung. To me, developing an unlimited supply of manufactured lungs was just developing a better medicine for my daughter and everybody else with pulmonary hypertension. Klein: How far away are we from a point when we will have this ready supply of lungs? Lungs are in short supply now. People die all the time unable to get transplanted lungs and other transplanted organs. How far in the future do you think it is before a replacement lung would be as common as a replacement hip? Rothblatt: Hip! Exactly…. Some people will say that it’s 20 years in the future. Other people will say it’s two years in the future. The reality is probably a little bit more finely granulated than that. Because new technologies don’t pop into being fully formed and perfect. Take a look at something that people love right now, the iPhone. Well, it began as an iPod. If you’re old enough to have had an iPod One or an iPod Two, they look pretty weird compared to an iPod Nano today. The manufactured organs will start small and grow larger and larger. To get to the point of today, where pretty much anybody who needs an artificial hip can have an artificial hip, and there’s two or three manufacturers to choose from, I think you would be looking at the end of the 2020s. I would say that that would be not so much just my opinion, but sort of the center point of the bell curve. You’ll find some people who would say that point would be in the ‘30s. You’d find some people would say it could be earlier in the ‘20s…. Less than 5% of any medical experts and scientists would say that there will never be an endless supply of manufactured organs. This is an engineering challenge, not requiring new laws of biology to be discovered. Klein: Fascinating. 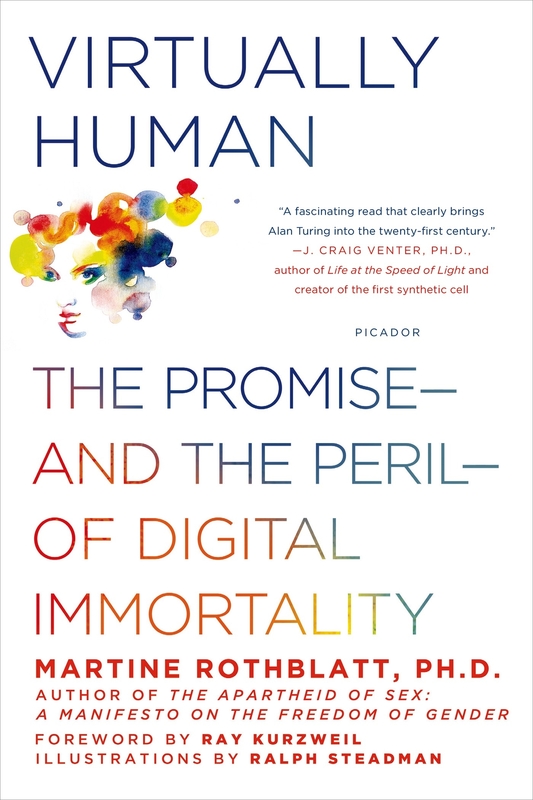 You talk about developing technologies, and you’ve written recently the book Virtually Human: The Promise and Peril of Digital Immortality. What in the world is “digital immortality”? Klein: Out there in cyberspace. Rothblatt: Out there in the cloud, with multiple cloud providers. So that’s big data. AI, or artificial intelligence, is an operating system that tries to replicate one or more functions of the human mind. So there is AI that, for example, can navigate your way around a new city, just like your mind would try to navigate your way around a new city. There’s AI that can recognize Katherine or Martine out of a list of 50 different photos. Many of us even have that AI now on Google photos, on our phone. It’s a kind of operating system. What happens with a virtual human is when AI gets better and better and better and cobbles together dozens, hundreds, even thousands of different types of AI software programs and is mated with the part of big data that is Katherine’s or Martine’s part of big data. You then can have a digital simulacra, or a digital doppelgänger, that will certainly look like you. It will sound like you. Voice and images are not that difficult. But more remarkably, it will begin to think and analyze and perhaps even feel like you because it will have had access to so much of your history. Klein: This is such a wild thought. A few questions about this. When many of us think about artificial intelligence, we think about thinking programs, memories, problem-solving. Yes, a computer can play chess. We get all that. Part of something that I certainly haven’t thought about before reading your book was, “Oh, it’s going to look and sound like me.” It’s going to be a clone of me. Why would we want that? Rothblatt: I think people want it in a number of different applications. It’s remarkable to me how many new technological developments have arisen from trying to help with a human disability. For example, the telephone, which we all take for granted, grew out of Alexander Graham Bell’s efforts to help the deaf. Another example, the scanner … arose out of Ray Kurzweil’s efforts to help the blind find a way to read things other than braille information. What’s happening right now is that as with the aging population, there are larger and larger numbers of people who are suffering from dementia and Alzheimer’s. My own company, United Therapeutics, has already received a patent on what we call an Alzheimer’s cognitive enabler. This would be a software system that would employ visual recognition, image recognition, voice synthesis and voice recognition, to be able to interact with family and friends, visiting an Alzheimer’s patient who has lost the ability to interact on their own. Klein: Wow. That is mind-boggling. I’m reminded of discussions about “do not resuscitate” agreements…. But our doppelgänger, our mind clone, may be making the decision for us based on our thinking, our thoughts encoded in this machine when we can’t think them any longer. Rothblatt: Absolutely, Katherine. But whoa! Flashback 50 years ago. Imagine our grandparents. Can you imagine our grandparents signing a “Do not resuscitate” order? They would say, “What do you mean, resuscitate? My heart stops, I’m dead.” The notion of there being an AED every hundred feet in a shopping mall that could bring a dead person back to life, that didn’t exist 50 years ago. Now we think it’s routinely possible that if you code in a hospital, the odds are not 100%, but are pretty good that they can bring you back…. Klein: I saw that in your book. That is so creepy. Rothblatt: Yeah. But, you know, it’s creepy to actually bring a dead person back to life, yet we do that routinely. So I have in my book what I call a social acceptance of weirdness chart. Things that are creepy or weird, whatever word we want to use, change over time in society. There was a time when there would have been nothing creepier than the notion of in vitro fertilization. And a test tube baby was considered an abomination. Now something like 2% of all births in America are IVF births. I mean, it’s a common way to be. It’s a big minority group. I do believe that as we move forward with these virtual humans, a future version, probably not past the 2020s, DNR [do not resuscitate] orders are going to include my mind clone. Klein: Wow. It would seem to me that this really could change so many things, including in some fundamental way, perhaps, our relationship to death. I assume a lot of rationality on our part, to not be sad to leave my family because I’m leaving my mind clone behind. You’ll interact with my mind clone. Klein: Really, it is a mind-boggling proposition. What it does to therapy, right? Rothblatt: The two best professions I recommend for people in the 21st century is cyberpsychology — and by that I mean being a psychologist who is an expert on cyber consciousness, or what might be also called cognitive computing as a more secular, less loaded term than cyber consciousness. People would say, “Well, that implies that there is consciousness.” Cognitive computing means sort of the same thing, but it’s a little bit less of a loaded term. Cyberpsychologists are going to be a huge profession. These will be psychologists who are experts in determining whether or not some software that purports to be conscious, that purports to be autonomous, that purports to be empathetic, that purports to value its life actually is or whether it’s just a fancy puppet. They had to reach a judgment. There’s a subset of psychologists that work on that. Cyberpsychologists would be much, much larger. The second great field I recommend to people in the future – and I know a lot of people are going to hate me for this – but cyber law. Klein: Going back to your roots as a lawyer. Rothblatt: I know a lot of people feel we have enough lawyers. We do have a lot of lawyers. But there are very, very few of the lawyers out here right now who are prepared to deal with questions of cyber law, of the legal rights and obligations of mind clones. Are these virtual humans? Are they agents of the biological human, so that everything that the virtual human does is in fact the responsibility of the biological human that created them? These are going to be major legal issues. The civil rights issues will be almost as big as the women’s and gay and African-American civil rights movements all combined. Klein: You would like to get the world thinking about these issues and preparing for them. Rothblatt: The reason I was motivated to write the book is I think that it’s always better to be prepared for something. That’s certainly been a big business adage of mine: to look around the corner. One of the reasons why I’m excited about manufactured organs is I see how all the hard work we did on small molecules, the ones that produce most of our company’s revenues today, is then under threat by generic companies after just a few years. Biologics, which are more complex type of medicines made in living cells, are much harder for companies to genericize. But they too are under threat from a type of generic called a bio-similar. So I’m trying to think of, what would be very hard for somebody to gobble up all the value that we worked so hard to create? Certainly creating a whole organ is sort of like the mother of all biologics. It’s a very, very complicated thing to knock out. But I digress a little bit…. Conscious mind clones will inevitably arise, or at least many humans will feel they are conscious, just as many humans feel their dogs and their pets are conscious. And some of those conscious cyber humans will be treated horribly, because people do horrible things. You know, not all humans are good. I believe that the psychic pain and the mental anguish to a cyber human is just as bad as the psychic pain or mental anguish to a flesh human. Pain is pain, and pain is bad. Klein: This cyber human is not a machine. It is something that is feeling pain. It’s not just a program that these bad things mean I feel bad. Klein: You are indeed a philosopher, in addition to your many roles. Let me ask one more question about these cyber clones, these mind clones. As I contemplate them and as I contemplate this kind of technological advance, it sounds very First World. I wonder how you envision these developments affecting emerging economies, economies where people are living in extreme poverty. What does that look like? Have you thought about that? Rothblatt: I have thought about it a lot. The book Virtually Human covers it quite a bit. I talk about the fact that nothing spreads faster and more democratically than does software. It has zero manufacturing costs associated with it. In the short span of our adult lives, we went from only the wealthiest people having access to the world’s knowledge at their fingertips with a Bloomberg terminal, or being in a big academic library, to the fact that now almost three-quarters of the world’s population has a smartphone. Those smartphones can access Google and other search engines, and they have access to the entire world’s knowledge. Apps such as messaging apps are in fact free. Facebook, Twitter, most of their customers are in the U.S. There are more social media users in China than there are in all of the previously considered First World. Google, one of the most successful companies in history, is devoting a full-fledged effort to wire all of Africa by floating stratospheric balloons that will provide high-speed bandwidth over all of Africa. Already, the rate of cell phone adoption in Africa is faster than it was in the United States. The thing I like best of all about this field of virtual humanity is I believe that it will democratize faster than any technology in history. Klein: To wrap up, some folks have referred to you as sort of a trans-human, trans-everything. Certainly you have this passion of breaking through boundaries of all kinds: technological, communication, gender. Where does that passion come from? Has this always been part of you to push through the boundaries? Rothblatt: I think it’s too much to say that I push through all boundaries, and I’m trans-everything. I am transgendered. I do believe in the transhumanist philosophy, especially the ethical transhumanist philosophy. I am very much of a pro-migration person. I believe that if there aren’t tariffs on pork bellies and semiconductors, then there shouldn’t be tariffs on people. People should be free to go wherever they want to go. To me, it’s just kind of logical deduction. I was brought up in a tradition of two schools of thought that both promoted freedom of movement. One, I was brought up Jewish, and the Jewish history is basically one of being kicked out of this country, kicked out of that country, kicked off another country. It was kind of beat into my head as a little kid in Hebrew day school, that learning is important because people can take away everything that you have, but they can’t take away what’s inside your head. Then the other tradition I was brought up in was the American tradition of freedom. It’s the notion that we came here to escape tyranny from Europe. Or poverty from Asia. And then once we got here, there was a “manifest destiny” to reach from shore to shore — so this instinct for movement. There’s a world called transhumance. It’s not as well known as transhuman. The root of the word humance is humus, which is Latin for earth. The argument is made that human populations are by nature transhumance, because we moved out of Africa at least four different times, and before we settled down with agriculture, we constantly moved back and forth with the animals and the food sources that we lived off of. So I feel that I’m not so much a trans-everything, but I’m just like a human to the core.